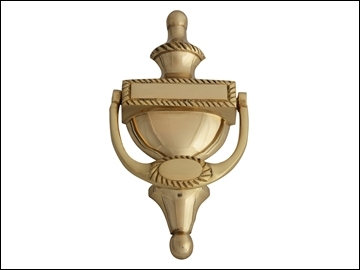 This Forge classic Georgian Door Knocker has traditional rope style border trim. It has been treated with a long lasting lacquer finish to prevent discolouration from weathering. 1. Establish position of knocker body and mark the postion of the fixing holes ensuring they are level. 2. Use a Ø7mm drillbit to drill fixing holes and place fixing bolts through these holes. 3. Repostion the knocker and tighten bolts. 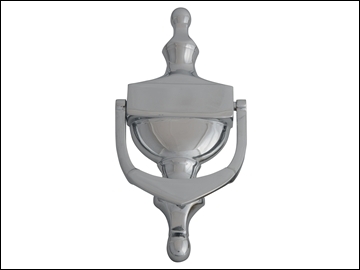 A classic Forge Door Knocker, which has been treated with a long lasting lacquer finish to prevent discolouration from weathering. 2. Use a 2mm drill to make pilot holes for screws.  Heavy-duty steel construction with triple locking bolts.  Powder coated finish to help prevent corrosion.  Compact design, pre-drilled holes and security fixings allow safe to be fixed into the floor and be hidden away discreetly.  Supplied with two keys.  Heavy-duty construction with twin locking bolts.  Simple to operate electronic keypad accepts numbers between three and eight digits, giving millions of combinations.  Three LEDs show security, power and operating status.  Also supplied with two keys for manual override should batteries fail.  Numbered, colour coded hook bars are adjustable to suit varying key sizes.  Includes mounting screws and wall plugs. Heavy duty steel cabinet with lock for hanging up to 93 keys. Supplied with labels, wall fixings and two keys. Display carton.  Simple to operate electronic keypad accepts numbers of between three and eight digits, giving millions of combinations. 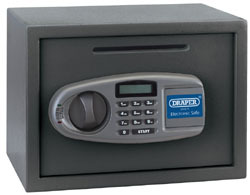  Heavy-duty biometric finger print safe.  Double safety lock requires electronic access code or finger print to open the locking mechanism. 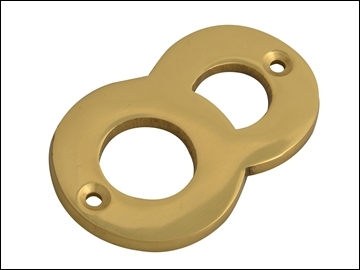  Powder coated finish for added corrosion resistance.  Powder coated paint finish to prevent corrosion.  Cabinet door is evenly locked by five 25mm locking bolts, one top, one bottom and three along the side.  Side walls and floor are carpeted to protect guns from damage when putting away or taking out of the cabinet.  Cabinet includes a set of securing bolts with rear and bottom holes for fixing to the wall and floor.  Includes two large keys for locking the main door and two small keys for locking the internal ammunition safe.  Manufactured in accordance with BS 7558:1992.  Features electronic keypad lock or can be opened manually with the override keys provided and two small keys for locking the internal ammunition safe. 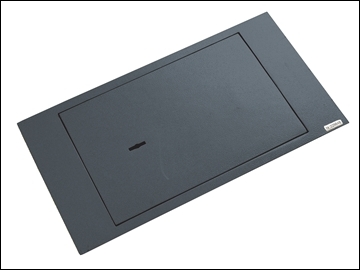  Cabinet door is evenly locked by five 25mm door bolts, one top, one bottom and three along the edge. 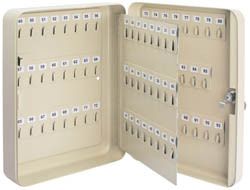  Cabinet includes a set of securing bolts with rear or ground holes for fixing to the wall or floor.  Features electronic keypad lock or can be opened manually with the two keys provided and two small keys for locking the internal ammunition safe. 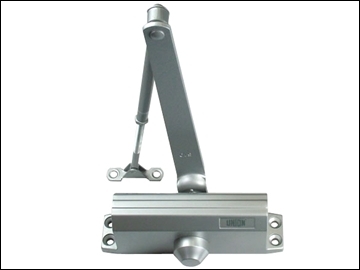 UNION door closers are mainly used in commercial and public buildings but may also be used around the home where circumstances make their use desirable. They have a variety of uses and applications one of the main ones being to keep a door closed to limit the spread of fire and draught throughout a building. There are many different types of door closer available ranging from the simplest gate spring up to the more industrial floor springs. This UNION UNNJN8803SIL small bodied standard size 3 fire door closer is surface mounted, suitable for right or left hand doors, with fully adjustable hydraulic door speed and latch control for a comfortable close, the 8803 has an adjustable arm so you obtain the correct pressure. 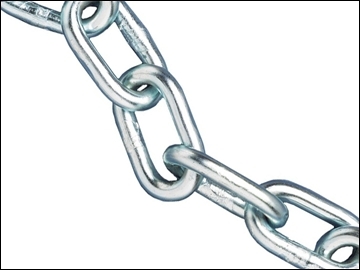 Our Welded steel chains are made to UK and International standards, with the link side welded for extra strength and quality tested. 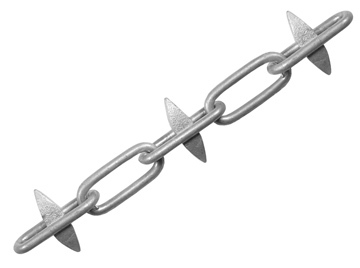 Mild steel welded straight links made to form an A style short link chain. Bright Zinc plated. 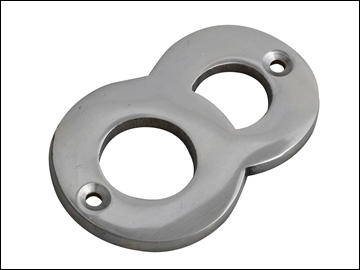 Ideal for general purpose applications such as securing loads, Made to DIN5685 standard. 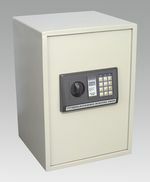 Solid steel construction safe for use in the workplace or home. 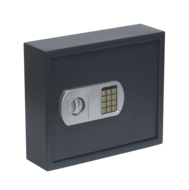 Special posting slot allows credit cards, letters and documents to be put into safe without opening. Resistant to most hand and mechanical tool attacks. Electronic combination keypad lock with a programmable 3-8 digit security code system.  Simple to operate electronic keypad accepts a combination of between three and eight numbers, giving millions of combinations.  Includes battery back-up and manual override.  Compact design, pre-drilled holes and security fixings allow safe to be hidden discreetly away.  Supplied with two shelves and four support feet. 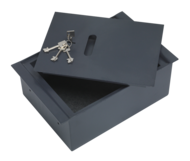 The Yale YALYFS floor Safe is compact and discrete with pre-drilled holes and fixing bolts allow fixing to joists under floorboards. 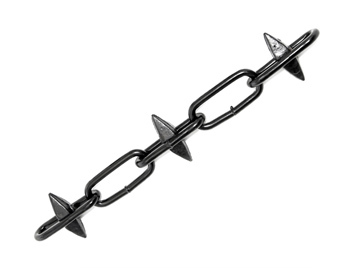 It is easy-to-use with a high security mechanical keysteel construction black finish. In addition, the base is lined with soft material to prevent damage to contents. Cash rating £1,000 or valuables £10,000. 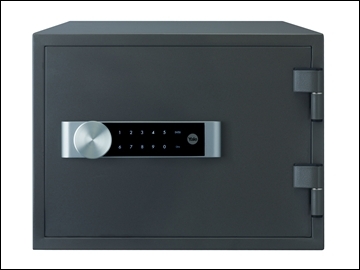 The Yale YALYSB250EB1 premium home safe is designed to protect cash to the value of £1,000 and valuables of £10,000. 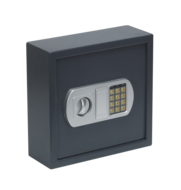 The safe has 22mm electronically motorised locking bolts, a 6 lever double bitted manual override lock with two override keys supplied, a laser cut door with minimum gap and reinforced hinge and mounted opening spring. The digital keypad has a blue backlight LCD display, with low battery warning is resettable to a 3 to 8 digit usercode with the display code having an on/off function. 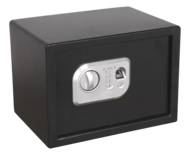 The Yale YALYSB400EB1 premium laptop safe is designed to protect cash to the value of £1,000 and valuables of £10,000. 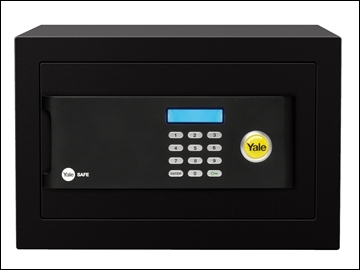 The Yale YALYSM400EG1 Certified Office Safe is designed to protect cash to the value of £2,000 & valuable £20,000. 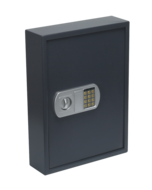 The safe has 22mm electronically motorised locking bolts, a 6 lever double bitted manual override lock with two override keys supplied, laser cut door with minimum gap, reinforced hinge and mounted opening spring and amoured steel anti drill plates. The digital keypad has a blue backlight LCD display, with low battery warning, is resettable to a 3 to 8 digit usercode with the display code having an on/off function plus an internal light. 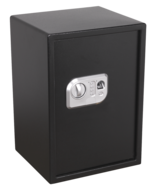 The Yale YALYLB200EB1 premium laptop safe is designed to protect cash to the value of £1,000 and valuables of £10,000. 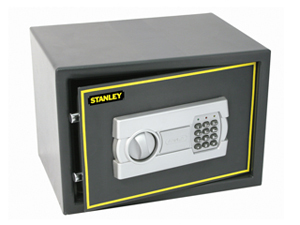 You open your safe using a code you choose yourself, so its easier to remember and its just as easy to re-set. When you enter your secret user code, the 22mm electronically motorised bolts withdraw and the door opens automatically. 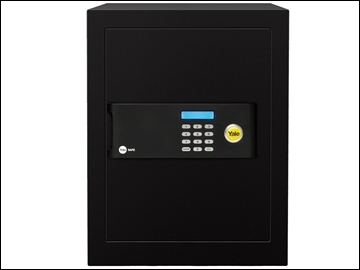 To override the electronic lock, the safe can always be opened through the high-security six lever lock with a double-bitted high security Yale key. The key hole is concealed behind the Yale logo badge. 2 Yale keys are supplied. Laser cut door (1mm gap) with reinforced hinge and mounted opening spring. Digital keypad with blue backlight LCD display. Plastic buttons, 4 incorrect entry alarming. Combination of 3 to 8 digits. Low battery warning. Display code on/off function. Sound on/off function. 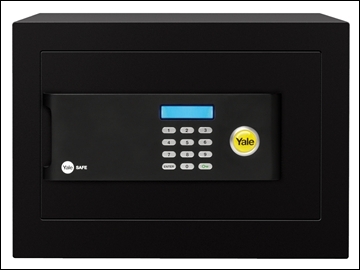 The Yale YALYFM310FG2 medium fire safe provides up to 1 hour fire protection for documents and the lock is digital with a touchpad interface. 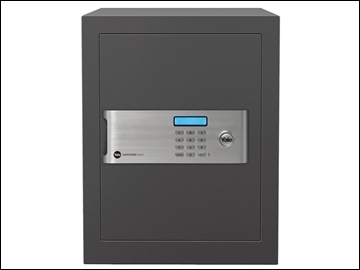 The safe has an epoxy sealed shell of galvanised steel which gives double rust protection and a high security electronic lock (over 1 billion combinations), which is programmable for one-time user code - ideal for visiting guests who may need to use the safe for a short period. The back end bolts secure the hinges from attack and it is tested & accredited to Swedish & Korean standards. Re-settable 3 - 12 digit user code. Privacy number input - real code followed or preceded by random numbers opens the lock. Assists if you suspect your code is being observed by an onlooker. Time lock (if wrong code entered) - can be set from 3 to 9 minutes (factory set 3 minutes). Lock-down period can be set from 1 to 48 hours. Safe can be shut down and cannot be activated for a given period. Ideal if you are away and have other people entering your property. 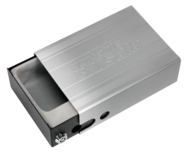  Car safe made from aluminium and steel, ideal for holding valuable items such as SAT Nav's, mobile phones and cash.  Tubular key lock with stainless steel bezel supplied with two keys.  1mtr Long tethering cable system enables secure fixing under most car, van and commercial seats.  Easy to install in seconds with no drilling or fixings required. Removable adjustable note and coin compartments to accommodate a variety of currencies. 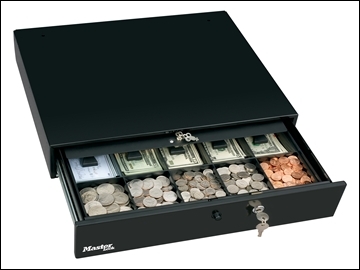 Coin rolls store conveniently behind the removable cash tray. 485 (L) x 305 (I) x 95 (H)mm. 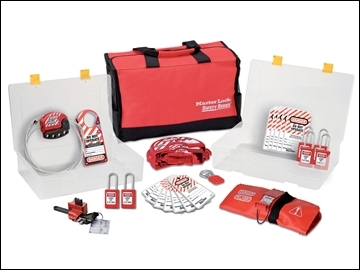 Lockout Pouch Kit combines and organises commonly used electrical and valve lockout devices. Single compartment lightweight pouch with velcro belt loop. Compact Lockout Pouch with velcro belt loop and Electrical Lockout Devices and Xenoy Padlock. 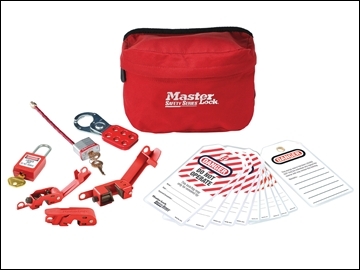 Masterlock 1458E410 Lockout / Tagout Electrical Group Kits combine and organise commonly used electrical and valve lockout devices. Lightweight carrying cases for maintenance teams. Modular, transparent compartments for effective grouping of lock-out equipment. Includes case 1458; 6-410RED; 2-7C5RED; 1-420; 1-427; 1-S806; 1-487; 1-488; 4-493B; 2-491B; 2-496B; 2 bags of 497A. 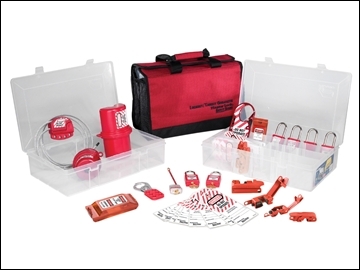 Lockout / Tagout Valve Group Kit Lockout kits combine and organise commonly used electrical and valve lockout devices. Includes case 1458; 6-S31RED;1-420; 1-427; 1-S806; 1-480; 1-481; 1-482; 1-483; 1-468L; 1-S3068MLP; 2 bags of 497A. A pack of two Forge traditional Spring Door Stops for wall mounting at low level. Supplied with fittings and fitting instructions. 1.Remove fixing plate from spring and screw to skirting at desired position. 2. 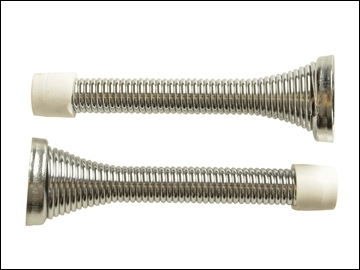 Place spring back against base and turn clockwise so that the spring is rethreaded into the base. N.B. 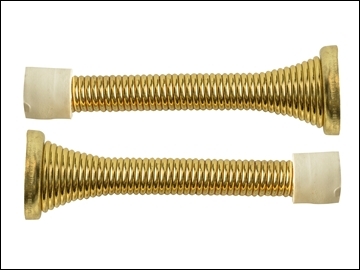 Additional fixings may be required for fitting to solid or hollow walls. The FGEDSSPRICH Door Stops have a long lasting chrome finish, with a rubber cap to prevent marking and damage to the door surface. 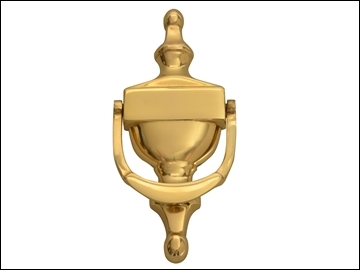 The FGEDSSPRIBR Door Stops have a long lasting brass finish, with a rubber cap to prevent marking and damage to the door surface. 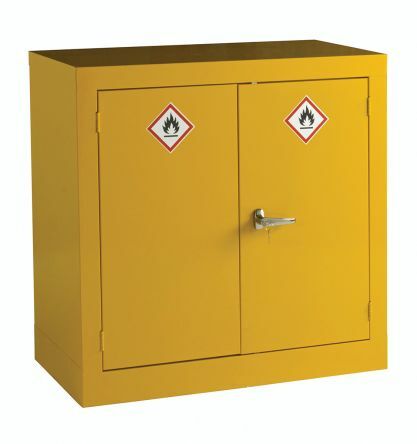 Hazardous storage cabinet ideal for storage of flammable liquids, pesticides and other hazardous substances.